Some patients (and staff) can be turned off or scared off by the ‘A’ word. So sometimes this is about explaining that artisticness can take many forms; it’s not just about painting. Language is important here, too. ‘Creative Expression’ may go down better than ‘Art Therapy’. The key message to get across to patients is that they don’t have to be good at art to express themselves or be creative. Self-expression without the need for words or explanations. The benefits of providing something arty everyday are vast. It helps boost motivation, it’s validating to have ones artwork displayed and inspiring for other patients. It’s tactile, physical and visual and it also brightens up the place! Getting involved in an art project can be absorbing too. It takes one’s focus off symptoms, thoughts and feelings, yet these can be constructively channelled into something satisfying and constructive. 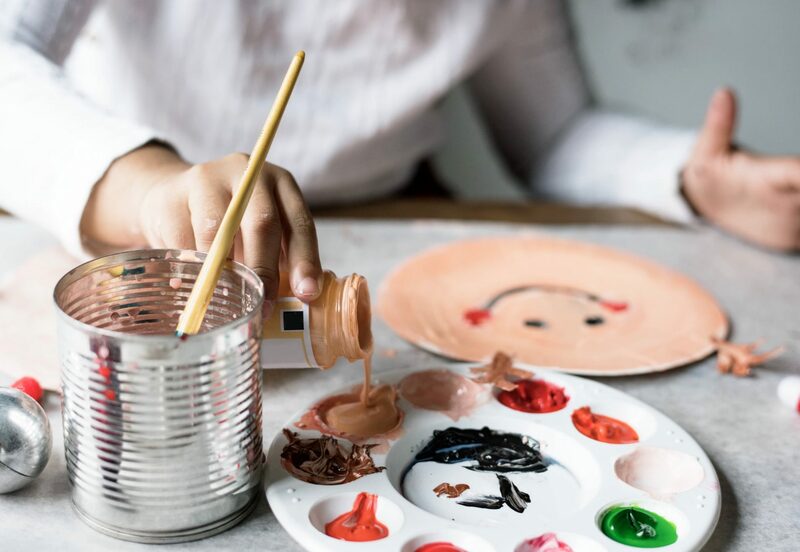 One ‘rule’ that we’d like to suggest is that there’s no rules when engaging in something creative, beyond things like it being best to keep the paint on or near the paper! There’s no right or wrong and that’s incredibly liberating. At times art can be fun and light-hearted or intense and meaningful. For this reason it’s important to give patients the option of either keeping the art or displaying it. Photography is a particularly enjoyable and satisfying activity for many patients. It’s a powerful way of seeing things from different perspectives, bringing things into focus; taking photos is very absorbing, with instant outcomes, different levels of challenge, suitable for people with different abilities and emotional states. And patients who have no interest in using a camera often appreciate looking through their own photo albums, looking at glorious books of photos (eg landscapes, animals, gardens) or visiting an exhibition. Exhibitions of art by patients in the ward, hospital and local venues. Current service users, produce artwork to be displayed within the unit. This is both group projects and individual artists. Each individual artist is provided with a specific area to display their own collection of artwork (following written consent from the service user), and there is a written description provided to be displayed alongside the artwork. A more recent development has been the loan of this artwork to outside agencies to be displayed in exhibitions, the last one being at the Town Hall. 9 paintings by inpatients were exhibited in the Art & Soul exhibition in Richmond Riverside Gallery and one of these was chosen for the exhibition’s publicity poster. A local day centre displays paintings in the hospital and some user’s paintings are also displayed. There are ongoing discussions with the local college to attempt to have them display art work. Patients have really enjoyed writing about their trips and displaying their artwork in the corridor. They are very proud of the work they do and really appreciate having it on display. It is becoming a focal point of discussion for visitors to the ward and is helpful for newcomers to see the range of activities that they may become involved in. An artist has been commissioned to work with patients to develop artwork, patients have developed graffiti art which is on display. It’s good to tie art activities in with season events like making Christmas cards. It’s great seeing grown men in the art and crafts groups making their children birthday or Christmas cards. This seems to decrease the feelings of guilt about not being at home with them. It provides a connection to home, too. Patient’s design the hospital Christmas card each year. Encouraging patients to get involved in making a calendar of art work to sell to raise money for ward resources. Also gives them a sense of purpose and involvement. Secure units taking part in the fabulous Koestler Awards. Linking with community arts’ groups to give patients fabulous experiences in and outside hospital, with drama, dance, art, music. A 12-week art project took place with local artists producing photography, storytelling and textile pieces. A local historian ran an activity about the local community, liaising with the textile artist. An art MA student is working with a service user on a project. Once a week patients can go to user-led community arts group, Atrium. This is an integrated resource – i.e. not just for mental health service users. Patients might decide to continue going to there when they leave hospital. A university employee is part of a two-year project focusing on working with agencies on developing skills and confidence in staff in working in creative ways with service users. They are currently working collaboratively with the Star Wards group to develop the skills of inpatient staff. Each ward will work on a project entitled What Liverpool Means To Me, which will be supported by the artist employed as part of the Creative Wellbeing Initiative. All patients are encouraged to enter national competitions such Koestler Awards. The ‘ARTiculate’ exhibition supports mental health awareness by hosting an exciting exhibition of artwork by local people with mental health issues. Now this is a hospital that truly embraces art! Art by patients, with patients, for patients. Here are some of the projects they’ve had; many more are described on their website. Stafford artist and Trust regular Mark Uttley is leading workshops to give a gloomy corridor a new lease of life on the dementia ward at Stafford. Older adults at Baswich and Bromley wards took part in mixed media visual arts workshops led by Leek-based artist Viv Young. Sessions at Baswich took people’s lifestories as inspiration, while at Bromley people tried out different techniques every week. Student artist Sharon Taylor came to the Brockington Unit on a placement to run a series of weekly art groups over six months. The sessions were very relaxed and people got the chance to experiment in different 2D media including drawing, pastels and collage. The mums at Brockington mother and baby unit took part in a series of eight sessions with textile artist Hollie Caley. Together they created artworks including canvases, paper shoes and hand-made books drawing inspiration from childhood nursery rhymes and fairy tales. Service users from Stonefield House brushed up their digital photography skills by documenting the building work in progress at Ellesmere House to create artwork for display on the new ward when it opened. Large-scale refurbishment project of Baswich Ward’s end-of-life patient and relatives/carers’ rooms. This included installing commisioned artwork by glass artist Sue Purser-Hope and painter Lucie Hill (whose work is pictured). Residents of Stonefield House Learning Disability Unit created a new relaxing area in their garden. Staff and clients on Bromley Ward enjoyed a series of visual art workshops delivered by professional artist Clare Lord. Clients on Kinver Unit recently enjoyed a series of photography workshops. Using different methods of photography they created a number of striking images. Clients participated in textile art sessions with professional artist Jennifer Collier and produced a number of colourful and innovative pieces. Many of these are now displayed on the ward. The Hatherton Art Group takes place every Wednesday and is lead by artist Mark Uttley who has facilitated a wide range of art projects around the Trust. Service users on Chebsey House, St Georges Hospital enjoyed taking part in a series of art workshops led by volunteer artist Clare Lord. This huge refurbishment project took place in the communal area of Norbury House (an intensive care unit for adult acute mental health patients). Service user designs are currently displayed on the walls of Norbury House. A new Trust Art Exhibition officially opened at Mellor House. Due to the success of this project the competition is to be an annual event culminating in art exhibitions in different Trust locations. A series of five creative writing workshops were held mainly on Brocton Ward and Chebsey Ward where participants were introduced to a range of exercises and writing games to enable them to enjoy different ways of writing. Stonefield House launched its new website at the Service User and Carer Celebration Day. The site is designed predominantly for the clients at Stonefield House to enable them the opportunity to create their own web pages. The Monday Art Group at Signpost Community Centre created a collection of beautiful jewellery. They worked with a professional jewellery maker who started with basic designs and then progressed to more intricate pieces. The project is being led by Jane Dew, a professional textile artist and Amy Spittle, an OT with the Trust. The clients are learning a range of textile skills which could be applied to all kinds of creative ideas. The Signposts: Show me the Way Arts Project was designed in response to concerns raised by the Community Mental Health Team who would work from the centre that those who are most in need may not automatically access the services on offer there. The Silkmore Art Group engaged with families in the area and enabled them to take part in a project where they worked with professional artist Caroline Jariwala. Service users from Stonefield House have also created artwork for the entrance on the theme of welcoming people and a weekly art group is planned for service users at Ellesmere. In celebration of WMHD – what a brilliant opportunity to get all arty and crafty (as if you need one!). Information on where to get help, advice, support or just find out more about mental health issues. Tea, coffee, squash and home-made soup available….yum! I used to take my camera with me on leave and made a little scrapbook of everything I got up to. I love in art therapy when we are given one word as inspiration and we all interpret that in different ways. We get a chance to explain what it means to us and appreciate how others feel. I never wrote a poem before coming into hospital. Now writing them gets it all off my chest in a constructive way. I liked anything creative as both a way of distracting myself and as an outlet for emotions etc. I enjoyed making collages (the cutting up of magazines was a good outlet for frustration in itself!). I also liked it when staff arranged activities such as jewellery making or flower arranging as it broke up the monotony of being on a ward. I also really enjoyed writing poems as a group. Expressing myself through art stopped me from kicking off and my usual self destructive patterns. Finding a bit of creativity was a positive. I was grateful that my friends helped me make cards and things. I found I had hidden talents, like doing pottery. I’ll continue doing this as a hobby when I leave hospital. I was taught how to knit a scarf, it helped build up my concentration and occupied my mind. I felt I really achieved something and wear the scarf with pleasure. Painting and drawing is a great way of expressing yourself without having to speak. It was a great release for me and I now have my pictures displayed at home. I’ve brought in prints of my photography and the ward matron let me put them up on the walls in the ward. Other patients have given me good feedback. They say they brighten up the place. I felt like I had let my kids down being in hospital so I made them cards and presents in the art classes. At least I could give them something. I only draw when I feel really destructive. It’s always been a way to vent my feelings but it can sometimes make me feel worse. So it was helpful that I wasn’t forced into attending art classes. I do a lot of craftwork like making cards. The staff let me have my own scissors which means a lot to me. It’s good how someone who hasn’t done anything artistic since school can feel able to pick up a pencil or a paintbrush and create a masterpiece. There are few places where one can do that. In the art groups I went to the OT kept on telling us that she wasn’t great at art herself. This really reassured me and took any pressure off to produce a masterpiece! I had to push myself to go to the art and craft group because I’d normally avoid this kind of thing. But I found it was worth it because it gave me something to do and I met new people. The Art Cafe takes place every Monday in the day unit. Some really inspiring artists attend it and also lots of novices like me. There’s always tea and biscuits and music. I always look forward to it. I always have some kind of personal art project on the go on the ward. It gives me a good focus. I designed some wallpaper for my home lounge based on a colouring sheet the OT brought to the ward for the art group. There was lots of art books on the ward that teach basic drawing skills. I spent quite a lot of time following these and learnt some new techniques. I portray my ways of staying well through my artwork. Other patients say they also find them useful. I draw a treasure map of all the different routes I could take in life. This made it clear what my options where and helped me choose the best one. I helped put together a calendar of patient’s artwork to sell and raise money for ward activities. I made a rabbit with clay in an art group. We designed our own mugs with special paint with the OT. It was good to put our own identity on a blank mug. Good that the ward lets us have our own mug on the ward and then take them home with us when we leave. At first no-one really spoke to each other in the pottery group. But after a while I saw the same faces and we became quite good friends. “I painted on a ward wall for the first time. Art and creative activities are run by an ex-service user, who became a volunteer and is now on the staff. She and a colleague were progressing the mural and bravely asked if I’d like to contribute. Actually, it wasn’t that brave as they’ve astutely created a detailed outline of the sporting figures, so even a klutz like me can splash a bit of paint more or less between the guidelines”. “This is the most beautiful, gorgeous, funky ward I’ve seen*. In the 70s, a prefab was put up as temporary home for the acute admissions ward. It was used til 4 years ago when the current jewel was built. It’s amazingly spacious, with loads of natural light, and artwork not only on the walls but also the ceiling and floor. As well as a patient-designed motif within the laminate flooring, there are several pieces of furniture which are as much sculptures as things to stick your bum on. The entrance area has a breathtakingly beautiful series of connected seats, sculpted from wood by designers whose work is in the V&A! There are other trendy seats in the garden, with blue and green swirly metal sides. (Lovelier than it sounds. I need to brush up on, or even acquire some, art review techniques.) And in keeping with the generally arty theme, one of the courtyards is… a sculpture courtyard!”* I should mention that in the last few years I’ve been lucky to visit other wards which are dazzlingly lovely and art-embracing. The dynamic Dorset Mental Health Forum ran a fantastic art project and their report on this is exceptional. Written by an OT, Jackie Lawson, it’s a richly described account of the project, which weaves in thoughtful observations about the individuals and how their art, and the process which created it, reflects important aspects of their personalities and lives as well as their recovery process. We strongly recommend having a range of arts’ materials easily available 24/7. Patients are much more likely to use, dabble with and enjoy arts materials if they don’t need to ask for stuff to be taken out of cupboards, don’t have to hang around waiting for staff to be available, taking staff away from other work etc. Adult colouring books are astonishingly satisfying for people in all sorts of emotional and cognitive states. A collaborative approach: patient paints very abstractly (blobs, wiggles, dashes, any thing at all) and the person with them adds their own blobs, squiggles or reproduction of the Cistine Chapel ceiling. Finding shapes, patterns, light and dark, colours – in the room, in books, magazines, photos, on TV…..
Toastal art: It’s easy peasy Marmite squeezy! Love it or hate it, Marmite led the way in turning toast into art, self-expression and a more interesting snack. Grab a squeezy tub of Marmite, honey, ice-cream sauce, and get doodling! Scrapstores are a fantastic resource for community groups who are in need of high quality art and craft materials for their members. The range of materials in your scrapstore changes from day to day and could include card, paper, textiles, paint, corks, wool, cardboard tubes, netting, gauze and a thousand other things!So scrapstores are veritable Aladdin’s Caves of affordable creative resources. There’s a surprisingly inspiring and creative video about scrapstores. 6 minutes, and you can fast-forward!